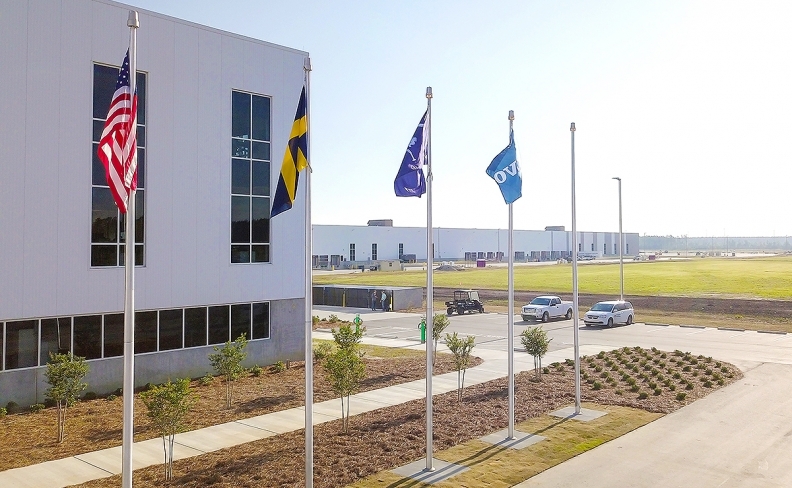 The South Carolina factory is Volvo's first in the U.S.
Volvo Cars is temporarily idling its new U.S. factory after Hurricane Florence spurred orders to evacuate areas in the path of a Category 4 storm. The automaker is shutting the plant Tuesday in light of the evacuation order that is in place for Charleston, Dorchester and Berkeley counties, Volvo said. The factory in Ridgeville outside of Charleston, South Carolina, opened in June. It is Volvo's first in the U.S. and recently began building S60 midsize sedans. Hurricane Florence's top winds hit 130 mph Monday to become a storm one step below the most severe level. South Carolina Governor Henry McMaster ordered evacuations of the state’s entire coastline, including the area around Volvo's factory. The storm is destined for landfall late Thursday or early Friday somewhere between Charleston and Norfolk, Virginia. The Carolinas are home to BMW's biggest assembly plant in the world, as well as factories where Daimler units build Mercedes-Benz vans, Freightliner trucks and Thomas Built buses. Representatives for the German manufacturers said they are monitoring the situation. The two states also are a major hub for tire making. Michelin, which has 14 factories and three retreading facilities in the Carolinas, is watching forecasts closely, spokesman Eric Bruner said.